The Farlam Inquiry’s recently released report into the Auust 2012 massacre of mine workers at Lonmin’s Marikana platinum mine in South Africa continues to attract strong criticism. 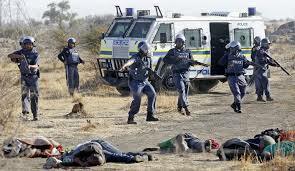 The Marikana Support Campaign says that the inquiry panel was hostile to workers from the outset. The Marikana Report may have exonerated top government figures, but platinum producer Lonmin did not come out unscathed. Cape Town-based think tank the Alternative Information and Development Centre (AIDC) is gearing up for an international campaign to have Lonmin’s mining licence revoked due to a number of reasons. The report found that Lonmin did not do enough to secure the safety of its employees, and women from Marikana have lodged a World Bank complaint against Lonmin. The World Bank has agreed to investigate whether Lonmin fulfilled its social and economic responsibilities to the Marikana community after receiving a generous investment earmarked for just that. The women say that Lonmin broke its promises to give the community a decent standard of living.